Earlier this week, NC State junior Griffin Lisle received a letter of complaint from his passive aggressive neighbors who were upset by the noise and chaos caused by a house party. After receiving the letter, Griffin decided to do what any college students would in this situation: drunkenly grade it and tweet about it. 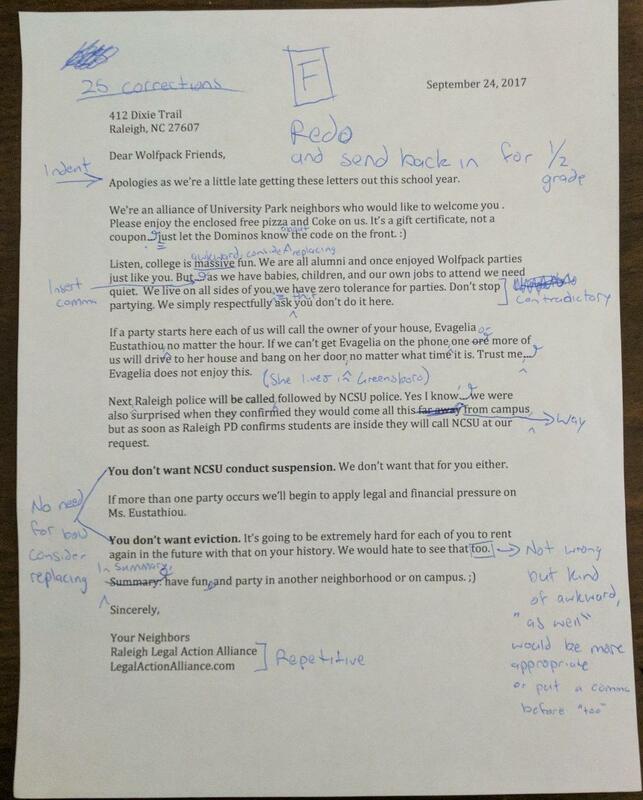 "Our neighbors sent us a letter because we had one party so I decided to drunkenly annotate it for them," Griffin posted along with a photo of the revised letter. Griffin annotated the letter with suggested corrections, calling the neighbors out on their mistakes. He gave them an F but offered to let them resubmit for half-credit. The letter begins nicely enough, by providing a pizza gift certificate, but after that things go down hill fast. The neighbors threaten to contact the landlord, and even mention involving the Raleigh Police and NCSU PD. The neighbor's most intimidating points are written in bold. "You don't want NCSU conduct suspension," they threaten. "You don't want eviction." Griffin critiques their use of awkward or unnecessary phrases, calls attention to repetitive phrases and suggests stylistic edits. Among the total 25 corrections are hidden gems like, "Not wrong but kind of awkward, 'as well' would be more appropriate or put a comma before 'too'." The houses around Griffin on Dixie Trial are home to families with children, so they weren't happy to be kept up by college party animals. "I said party in the tweet but it was more of a get-together," Griffin told The Tab. "We had a few friends over because we were relaxing after the game. In all it was about 20 people, give or take a few." "It would definitely help if the neighbors were willing to communicate with us instead of passive aggressively threatening us with a letter, though," he said. "We're just some guys in college that are trying to have a good time, but not at the expense of anybody else." Combine the words "drunkenly" and "annotate" and college students are immediately interested.